This is made from Real feedsacks....not reproductions. It is a pattern by Fons and Porter but I can't remember the issue. I have been collecting 30's repros for about 10 years now. Throughout my quest for these lovely little fabrics I happened upon many a quilt shop as you can imagine. Living in Minnesota was awesome for me as there were 3 quilt shops in Rochester, 1 in Owatonna, and 1 near where I worked in Albert Lea....oh and did I mention the bazillion shops by Minneapolis/St.Paul??? my lord it was heaven. Oh right back to this quilt....while I was shopping a 30% off sale and scarfing up a yard of ALL the 30's this particular shop had...a wonderful lady noticed the fabrics I was buying. She said she had been given feedsacks and scraps that she had no use for and wondered if I was interested....Ah YES! So naive as I was I gave her my name and address. After I drove home, I thought "you fool, why did you give that lady all your information" are you crazy! I did feel a bit crazy for doing that, but about 4 days later a package arrived with my mail. Inside were all these 1930-40's feedsack prints. I kept them for about 3 years before I started this quilt. 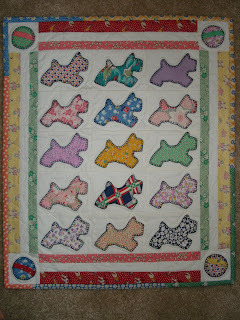 This is a reminder of that generous lady...a reminder of how precious just a small scrap were to a quilter even then. What a wonderful story & quilt. I love it. Thanks for sharing. Quilters really are the best sorts of people! It's a lovely little quilt.